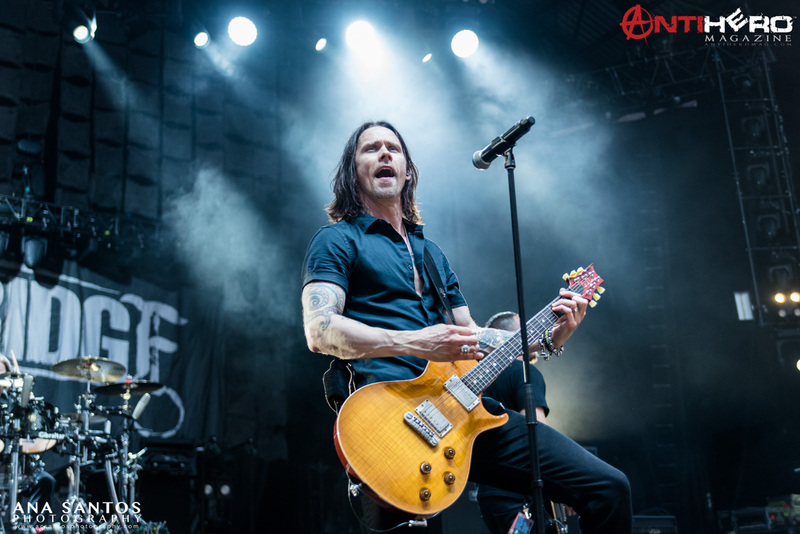 Does Myles Kennedy actually need an introduction? That was what I asked myself when trying to write this piece. Certainly, he would be instantly recognizable, both visually and sonically, to anyone that has followed rock music in recent years. 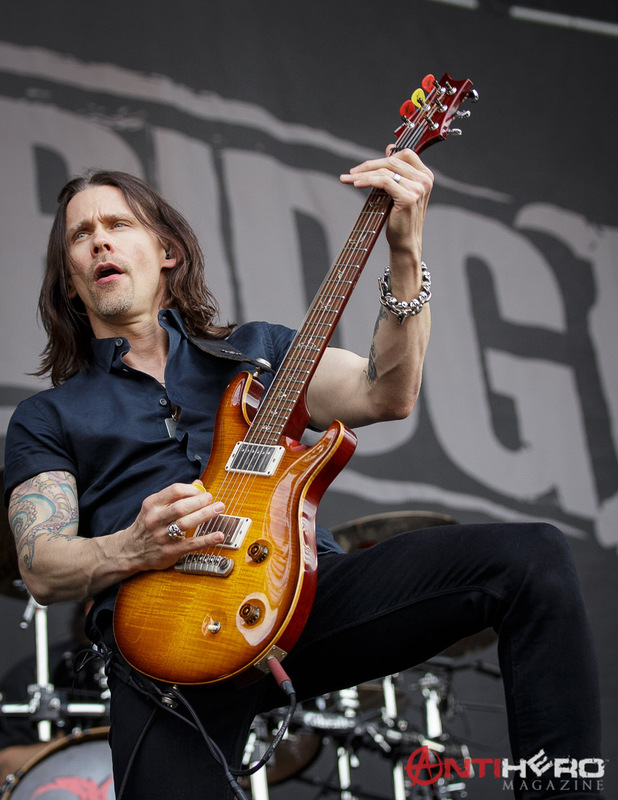 He is an industrious musician that always seems to be on the road, whether with Slash and the Conspirators, or through his work with Alter Bridge. He has quickly achieved a solid foundation and credible musical catalogue with both bands in the rock genre, and having attained a level of professional standing within the rock community, it wasn’t an easy task to set up this interview. Touring the UK on a package tour with Volbeat, Alter Bridge recently blew the roofs off of UK arenas, a phenomenon which I managed to catch at the Manchester show. 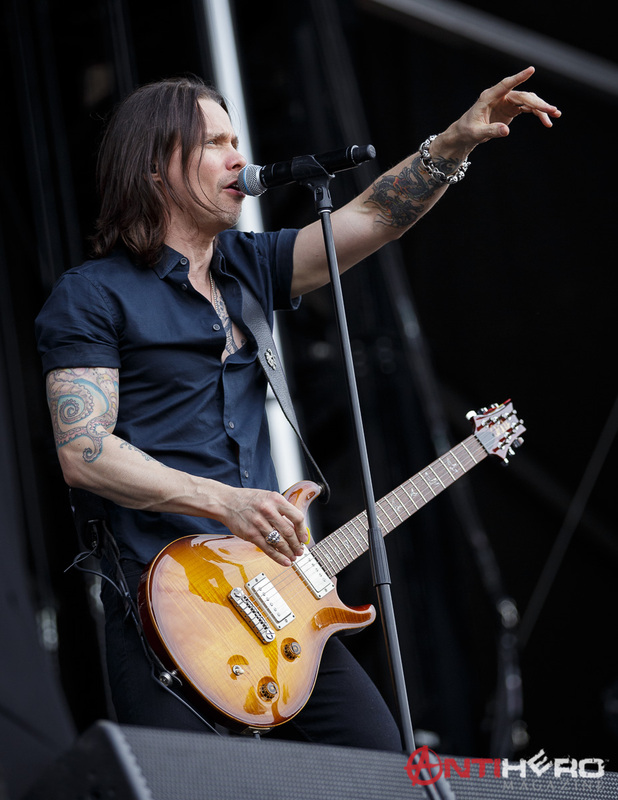 Initially setting out as a guitarist, Myles has appeared to grow into and become more comfortable in his new role of lead singer. This was a process of transition that certainly wasn’t as seamless as people may think. Finishing his tour and returning home for the holidays, I was immensely fortunate to catch up with the singer/guitarist during some “down time” before his festive break. I saw you in Manchester recently on the UK tour. Was that being recorded for a future DVD or CD? Anything planned? I think that, yeah, I think we recorded all the UK dates. Yeah, there’s talk of trying to do something in the future with those. Then of course, you’re off to America. What capacity of venues? Would you be doing arenas in America like you have recently played in Europe? You know what, in America it’s more theatres. America in general does not seem to have the appetite that the UK has for hard rock, but it has improved dramatically in the last decade. I think a lot of bands are very relieved to see this happening. It’s kind of ebb and flow to hard rock here, I guess like it is anywhere. 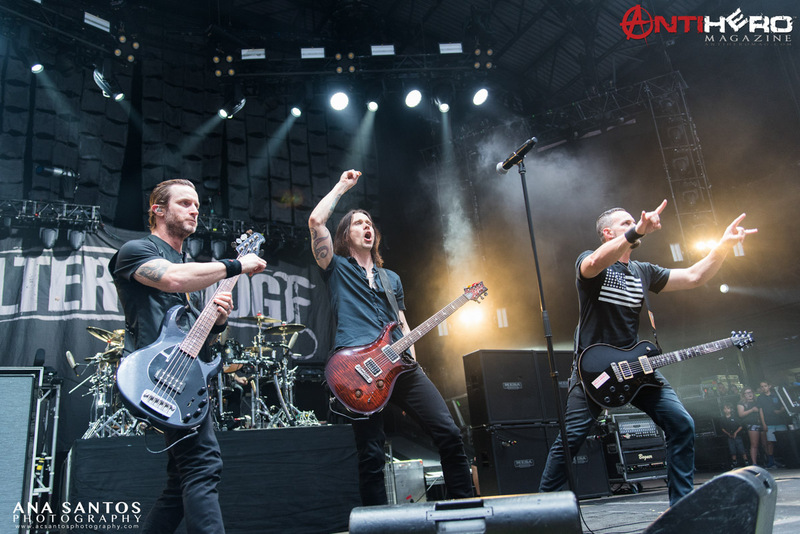 The UK was the first market that really gravitated towards Alter Bridge at the level that they have. It’s been wonderful to see that grow to arenas and what not. Are you going to be on another package for that, or will you just be doing your own show with the local support maybe? Yeah, well I believe that we have a band called Nonpoint coming out with us, but primarily it’s just a headline run, so not as much of a package deal. The Last Hero album has been universally praised. I just wondered how it was being back in the studio with Alter Bridge. It was great. It’s like one of those situations where, when we come back together, it’s very comfortable. We generally put out a record every three years, and go off and do our various projects and when we reconvene, it’s just very easy to kind of get back into the swing of things. It usually takes about two weeks total. We kind of dust off the cobwebs and get the creative juices flowing, but then we’re usually off to the races. The Last Hero, I guess, is testament of that. Do you have to adopt a different mindset in terms of writing and creating music compared with what you did in The Conspirators with Slash? Yeah, it’s definitely different. It’s a different feel. It’s a different from a lyrical standpoint and subject matter which is a little more… I don’t know how to describe it, but it’s usually a little more touching on certain emotions that I wouldn’t touch on so much with Slash. It’s good for me as a writer because I get to basically express myself in two different categories. It doesn’t get redundant for me as a writer jumping between those two bands, so that I can kind of stretch myself in different directions. It’s enjoyable. Of course, the album has come out on Napalm Records. What prompted the decision to even go with any record label in this day and age? That’s a good question. Some artists are choosing just to put records out on their own. We still felt like going with a label like Napalm would be advantageous for us because of their international reach. There are a lot of pieces that are already in place, and they were, out of all the labels we talked to, the most passionate and that’s what you’re always looking for as an artist. You want to have that feeling that they’re going to get behind you and stay behind you, not just throw you up against the wall and see if it sticks for two weeks. They seemed very committed and they come through on their promises. You always seem to be working. Is that strong work ethic something that you’ve always had from a young age? I think when it comes to music, yeah, because I don’t necessarily consider it work. In fact, when I try to power down which I’m supposed to be doing for the holidays here, it’s kind of challenging because I don’t… Even on the road, I don’t really like days off. I have to have days off to let my voice rest, but I usually wake up kind of dreading the day if I know I don’t get to play that night. I love to play. Have you ever considered releasing a solo album maybe from a different musical genre? I know jazz and soul are musical styles that, obviously, you don’t do with the rock bands. They are also types of music that you personally enjoy. That would be fun. You know, I do have a solo record recorded, and I’m starting another project as well, but they’re still… They’re not extremely different from things I’ve done in the past. You can do a lot of the singer-songwriter base, but if your question is, like, would I consider making like a jazz record, or something along those lines? That would be real exciting. It crossed my mind at some point to maybe do an album of say standards, more like covering of some of the great songs of writers from the past. That might be kind of interesting. I don’t know how the fans would respond to that, but as an artist I might kind of get a thrill out of doing something like that. You mentioned another musical project.Have you got songs recorded for that? Is there a band together or is it just in the early developmental writing stage? There’s a full record recorded. Can you share a little more information with me on that? A full record. Whether that record will ever see the light of day remains to be seen because, like I said, I’m still writing, and I could write a whole new batch of tunes that I wanted to record instead. Yeah, there’s a record mixed and done and just kind of sitting in the can. What musicians are you going to be working with on that? Will that be with musicians that you have collaborated with before or are these a whole bunch of new guys that you recorded the music with? These were some new guys. A lot of it I basically arranged on my laptop and put together just by myself, and then found some cats that were really good at… I found some session guys, and friends who I knew who came and pulled and taking some cool stuff. It just depended on what the song called for. You could always put that one out yourself maybe independent of a label? Maybe, yeah that’s not a bad idea because I guess it just depends on what my goal was for the record and how far reaching I want it to be. Is it just something I want to put out for fun, or something I want to put out and tour for a while, and then maybe I’ll consider a label that has the machine in place. We’ll see. Did you come from a musical family? I’m just thinking back, what would have been your first introduction to music? My first introduction into music was probably just from what I can remember was seeing Stevie Wonder on a children’s show called Sesame Street. He played “Superstition,” and that was a really profound moment for me. I still remember it very vividly. Probably one of my most vivid memories as a child was seeing him. I couldn’t have been more than four years old, so yeah, Stevie Wonder caught my attention very early on. Generally, I’ve read a few reviews of yours and you always come across as upbeat and positive. I just wondered what angers or annoys you? What angers or annoys me? I think intolerance, racism, things like that. I don’t like that. That bothers me. I feel like we’re all human. There’s no reason to treat anybody different just because of differences. We just really need to get past that, I feel as a species. Looking back, would you have any regrets or has everything just been a step forward in life’s great path? No, I mean, I’m sure I have regrets. I think one of the things I regret was not having more faith in myself early on. There was always a fair amount of trepidation and I guess a fair amount of really, for lack of better word, certain insecurities that I had to kind of overcome and struggle with. It just, I’m kind of frustrated with that side of, or I would get frustrated with that side of me and trying to have to deal with that and overcome it would get in the way, a lot of times, of creating and expressing myself musically. That’s probably my biggest regret, is just not having more confidence out of the gate as a youngster in particular. You did actually turn your back on music or have thoughts of maybe turning your back on music at one point? I did. I did. I hung it up. I mean I wasn’t totally out of music per se, but as far as the idea of being a recording artist and being a touring musician, yeah. It was right after The Mayfield Four, back in 2002. I kind of hung it up. I hung it up for about 18 months. Then I was just teaching guitar and living in Spokane, got married, and then I realized that that was not where I feel my destiny was supposed to be. I knew I had to keep chasing the dream down, and then the rest is history. You mentioned guitar playing then. How do you view yourself, as a singer or a guitarist, or a singer that plays guitar? I’ve always kind of viewed myself as a guitar player that sang. I mean I started as a guitar player, and the singing came much later. More than anything I guess songwriting is kind of my thing, so that’s where I really spent the most time trying to develop that side of my skill set – songwriting. Did you find it difficult to step center-stage, so to speak, on performing also as a lead singer? Yeah, that was very challenging at first because I thought I was just going to… The only time I’d step up front was to play a lead here or there, and so when I started writing songs and couldn’t find a singer, I kind of struggled with the idea of being the front guy. Through years and years of doing it, it’s something that I’ve learned to adapt and become more comfortable with. It’s easier if I have a guitar on than sans guitar. Do you have a favourite song to perform live? Is it something more melodic like “Blackbird,” or if you prefer performing the heavier songs like, “Metallingus,” for example? Yeah, “Blackbird” would definitely be my favourite. 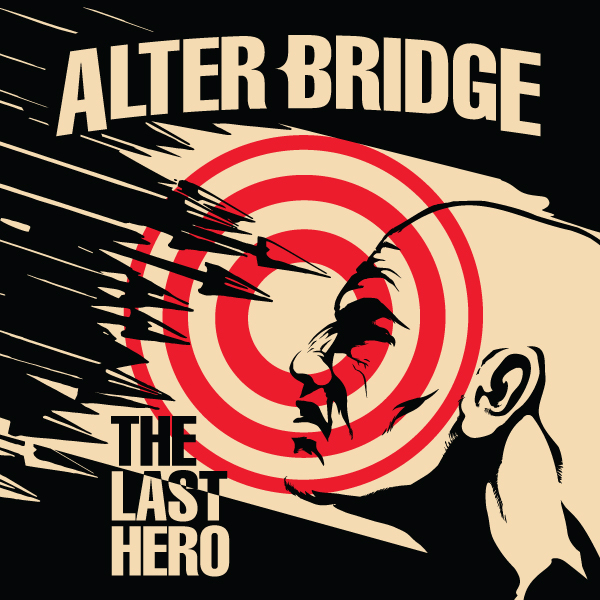 As far as the Alter Bridge catalogue, that’s my favourite track we’ve ever created together. I love performing it. Who would be the most inspirational musician that you’ve ever worked with? The most inspirational… I would go with Barry White as far as the amount of inspiration I got with him early on. In a lot of ways, I probably wouldn’t be doing this had I not heard Led Zeppelin. I would have to say Jimmy Page was a big one, massive just getting to stand in the same room with both him and John Paul Jones, and Jason Bonham. That was a very inspiring moment for me. What about your musical career? You have been famous through your work with Alter Bridge, and through your music that you’ve created with Slash, for many years. Do you feel that fame comes at a price? I think I’ve been lucky in that I’m not necessarily a household name. I’m not somebody who’s… It’s not like I’m a Kardasian. There’s still a lot of anonymity, which is great. I don’t feel like there’s been any sort of sacrifices on a day-to-day basis. I can walk down the street, and everything’s cool. Occasionally, somebody might recognize me and that’s foreign, and I get to meet bands. I feel like I still have much freedom. I don’t have to worry about paparazzi attacking me or anything like that. What in life would you be most proud of? Would it be something maybe musically that you created or maybe something personal? Oh man, I think what I’m probably most proud of isn’t necessarily something that I’ve created, but I think it kind of touches on what we were talking about earlier with regrets. I think I’m most proud of the fact that I was able to overcome the insecurities that were going to keep me from living my dream which was just learning to turn off those little voices in your head that tell you you’re not capable of doing something. I think the fact that I could keep those demons down eventually and have success to some degree. In spite of that, it’s probably one of the things I’m most happy with in terms of how life’s turned out. The glass for you at the moment would be half full rather than half empty. You tend to focus on the positive? Yeah, definitely the glass is half full. That’s for sure. Would you still have unfulfilled ambitions, hopes, and dreams? You know what, I still do, yeah. There are things I think with all the luck that I’ve had and how things have turned out in life, I’m trying to just make sure that I pay some of that forward. I’m just trying to help young people who have the same dreams achieve their goals and be a good role model. My wife and I are involved with certain work here in my hometown to help inspire that sort of thing and see some of that come to fruition. I think that’s my goal as time goes on, is to just try and pay it forward. We touched on this earlier. You’re always busy. You always seem to be out on the road. Do you ever get time to experience different cultures, foods, and people of any of the countries that you pass through? Yeah, I have. Not as much as I’d like, but that’s been one of the best things about touring. One event I remember very well is the two-year term with Slash when we actually played Lebanon. We played Beirut, Lebanon. I didn’t know what to expect because I grew up in the 80’s watching the news and seeing how things were playing out there. Getting to play there really was an eye-opening experience for me. With the food, in particular, it was unbelievably good. That was an incredible experience, so that’s one that jumps out when you bring that question up – Beirut, Lebanon. Japan as well? I mean, I know that Japan has been a source of inspiration for your tattoos, for example. Yes, yes. I love Japan. I love Japanese culture and food. Yeah, in fact we’re trying to put the routings together for next year, and I don’t know how it’s all going to play out. I’m one who is pushing for getting to Japan if we can, just because I love the culture so much. Just finishing with a couple. I’m sure Myles you’ve done many interviews from you first started playing music. I just wondered who you would personally like to sit down and interview with you asking the questions? Good question. That’s a great question. Actually, they’ve all been good questions. I’ve enjoyed it. I think I guess as a songwriter I’d like to sit down and ask someone like say, Sting, as an example, because he’s a great lyricist. I’d like to sit down and pick his brain in just how do he comes up with the things he comes up with. As far as maybe somebody who like more of a political figure, I’d like to interview somebody like President Obama after he gets out of office and just pick his brain. What was is it like running things for eight years? I’d just be curious how that kind of… how that works. I would want the unedited version. I’d really want to know what actually goes on with our government. Now that you’re out, the juicy details. I’d love to know that. That’s great Myles. Thank you very much. I don’t know if you’ll get much time to enjoy your holidays with all these interviews, but have a great Christmas.